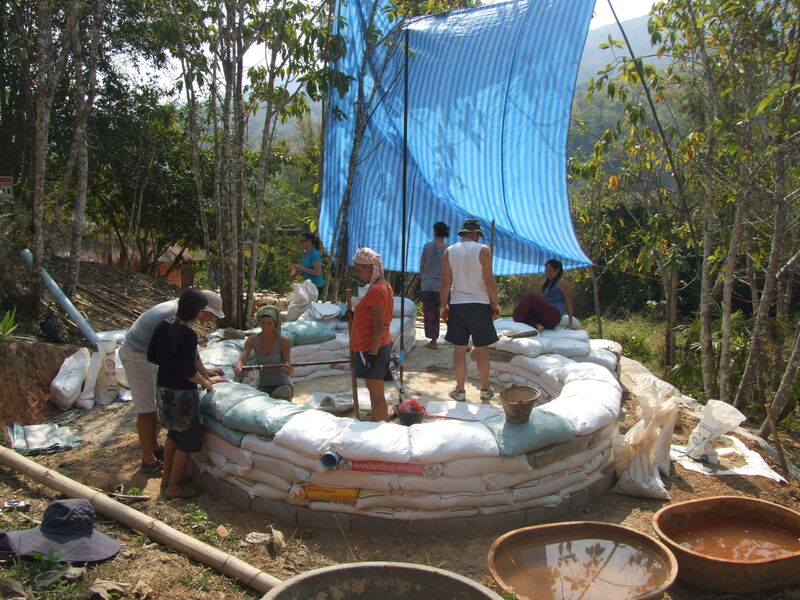 One of our recent workshops was on making an Earthbag Dome. 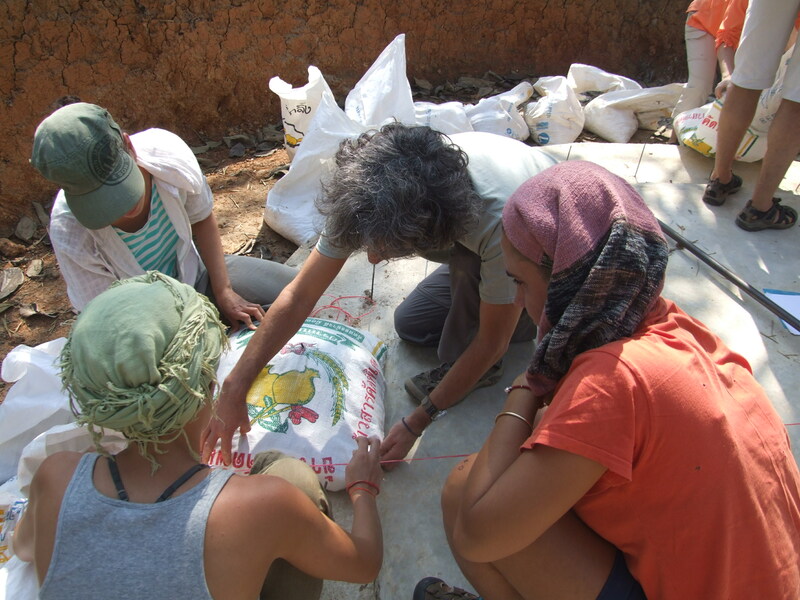 This was taught by Paulina Wojciechowska of Earth Hands & Houses (EarthHandsAndHouses.org). 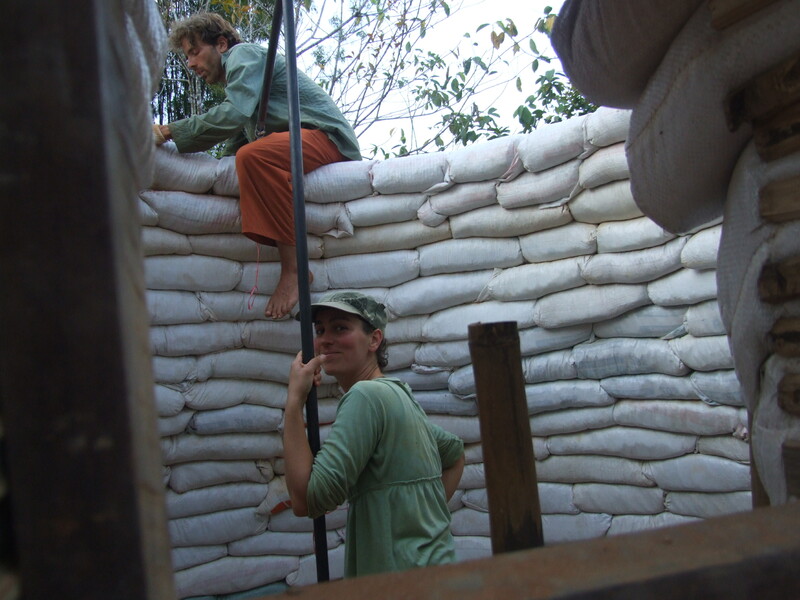 Paulina was one of the first people to bring the techniques of earthbag building to Europe, and in fact she wrote the first book on the topic: Building with Earth (Chelsea Green Publishing Company, 2001). 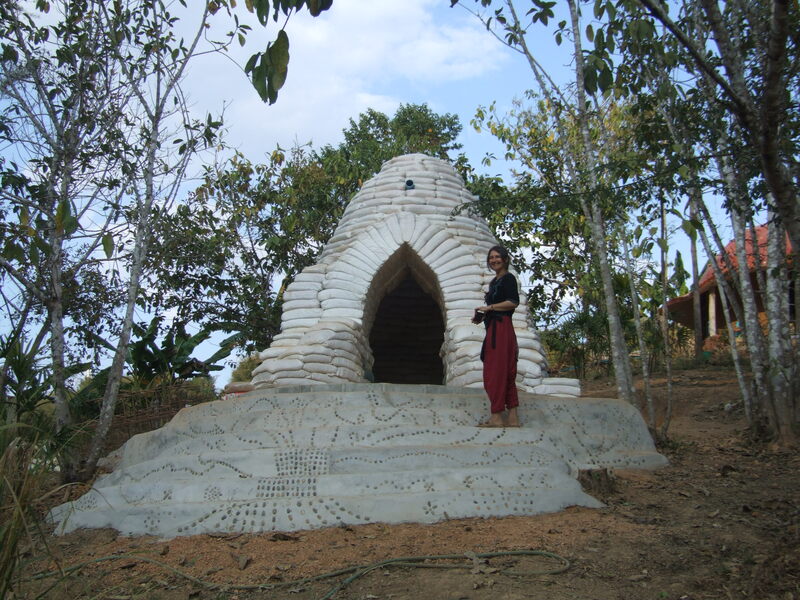 I met Paulina in 2011 when I attended one of her Earthbag Dome workshops in a wood in southern England. 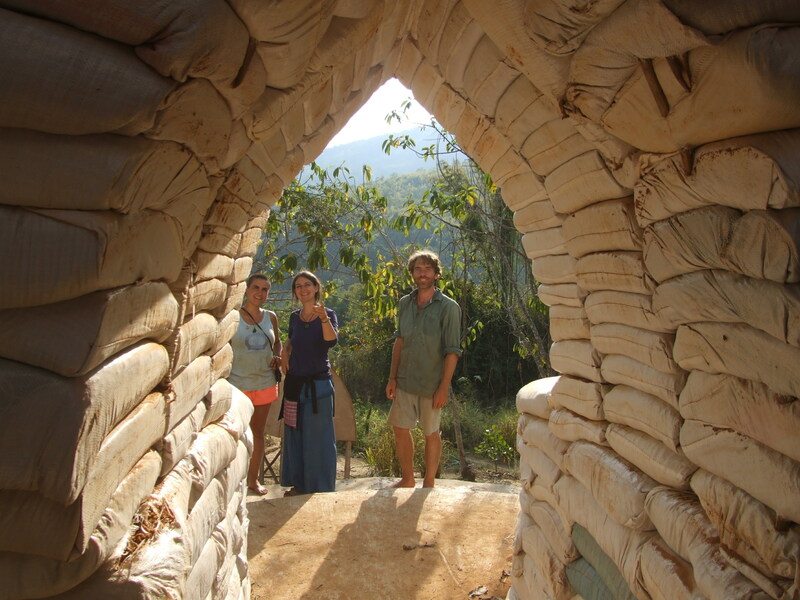 I was so impressed and inspired by Paulina and the art and science of earthbag building! 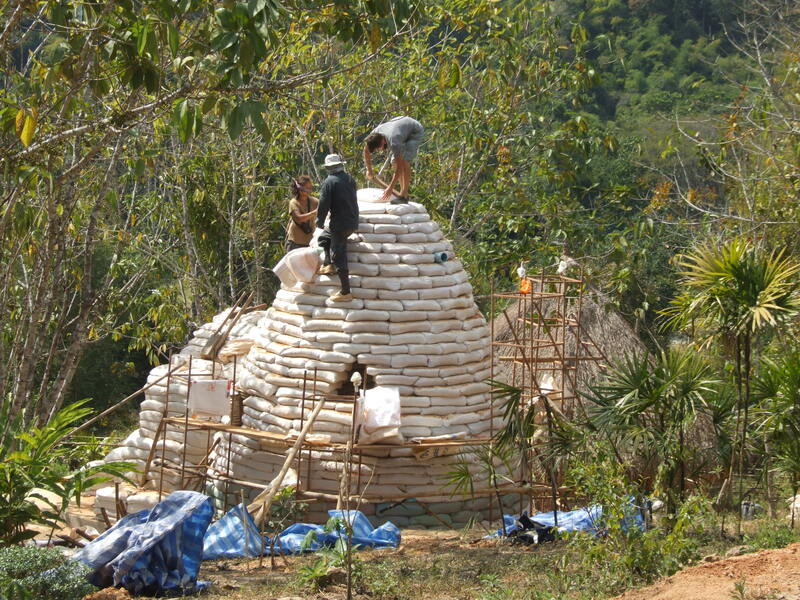 I used many of the skills and ideas from that workshop to create the design of my own rice-husk-bag buildings. Paulina and I corresponded and met a few times over the next few years, and coming to Thailand to run a workshop was high on our agenda. 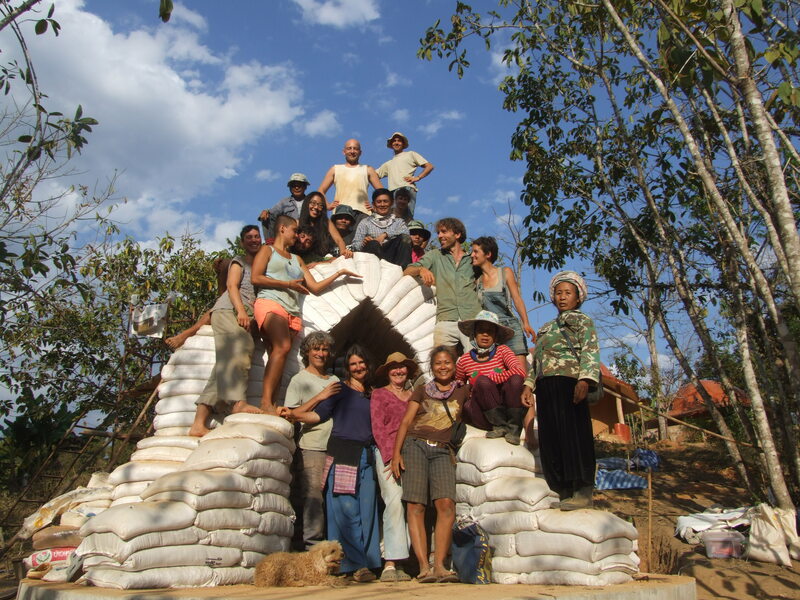 Finally, in 2014, everything came together and the workshop happened here in Chiang Dao, at Chiang Dao Roundhouses! There was a fair bit of preparation to be done. First we prepared the foundation. In a non-termite area, one may not need to have a concrete base, but here, we need it! 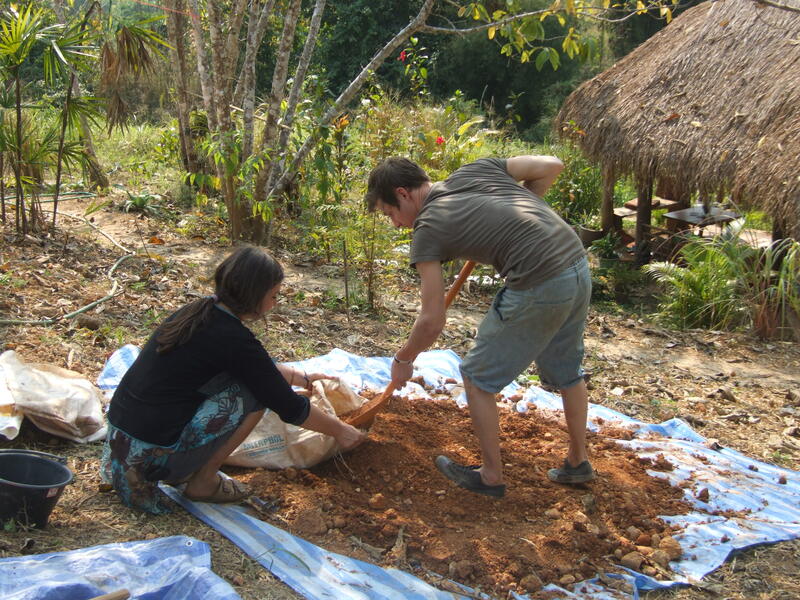 Preparing the foundations for the Earthbag Dome. 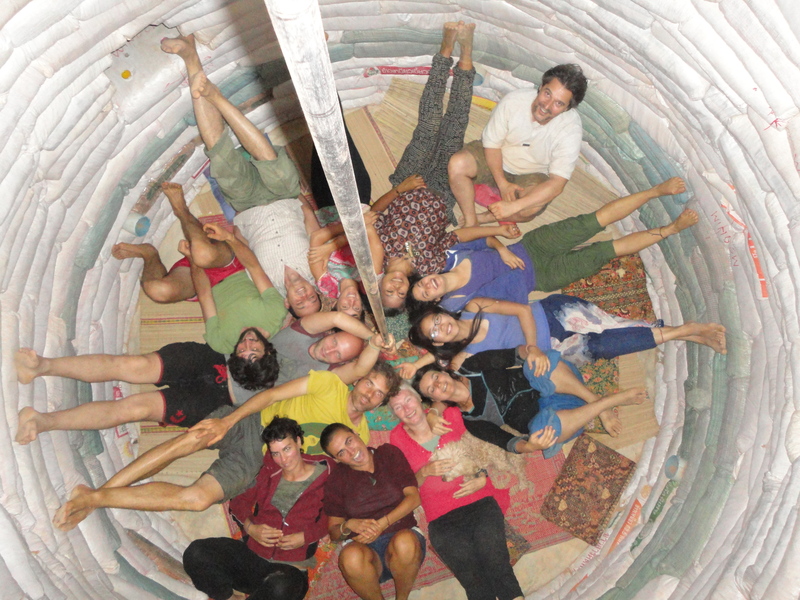 A dozen people arrived to take the workshop in February 2014, many from freezing temperatures in Europe. It was cold in the mornings here too, and at night, which surprised most people, but they enjoyed sitting round an open fire in the garden! By 10 am. the sun was shining fiercely and the temperature rapidly rising. 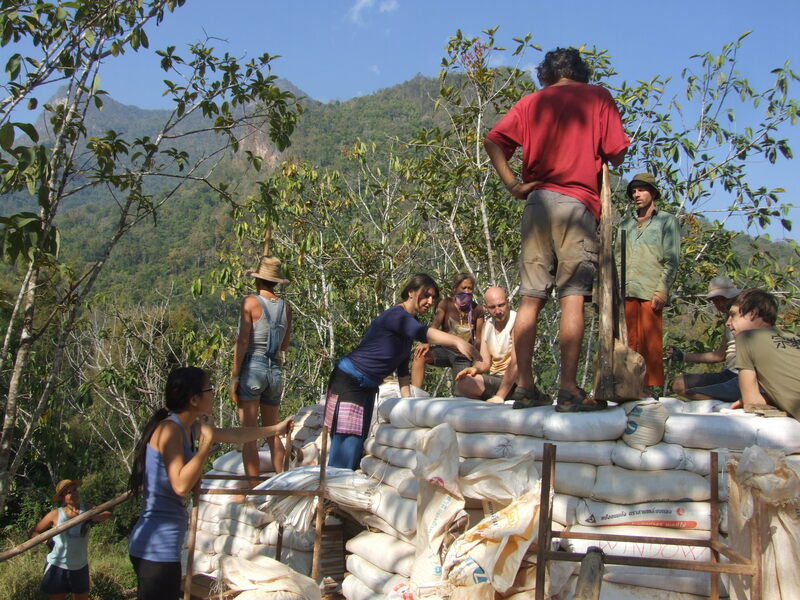 Here we are on the first day, enjoying the sun, and putting into place the first filled bag! The first bag filled with gravel takes its place on the prepared foundation. For the first layer, the bags are filled with gravel, and the second layer with sand. This is in case there is any water around, monsoons, floods or burst pipes perhaps. The water would just pass through and out the other side and the earth bags above would be unaffected. 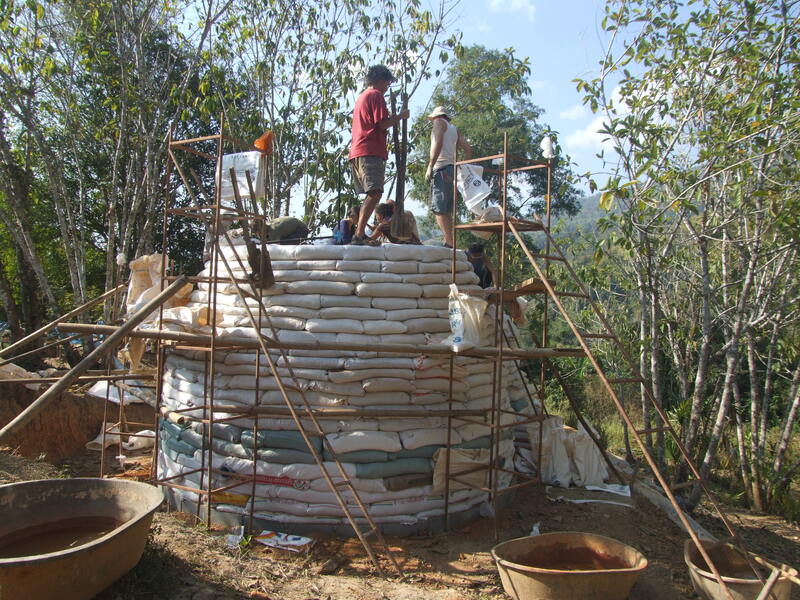 The third layer is the first of the earth filled bags. In the next picture you can see the group is up to the fifth layer. Keeping the wall of bags uniform is a rotating compass made from pipe, hose clamps, and a shelf bracket, which worked extraordinarily well. Using the compass to keep the walls uniform. The earth was brought in on trucks, and had been sitting around for a few weeks. Due to the heat it was very dry. Some water had to be mixed in with it, before it went into the bags. Filling a bag with earth that has been mixed with just a little water. The doorway was to be in the shape of a pointed arch. We made a frame of wood and placed it where the doorway was to go, and then made bags that were wedge shaped to fit around it. Making wedge shaped bags to go around the arched doorway. Notice in the picture above that the bags on the unfinished top row are kind of squashy. Once a row is finished it is tamped to make it flat, and then bamboo stakes are nailed into each bag to fasten it to the one below. 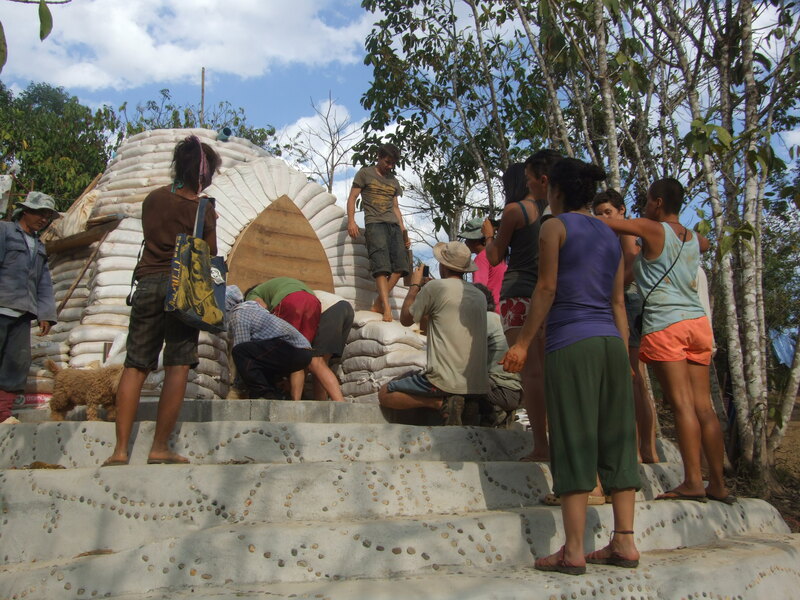 Ajarn (teacher) Paulina giving instruction, as the dome gets higher. 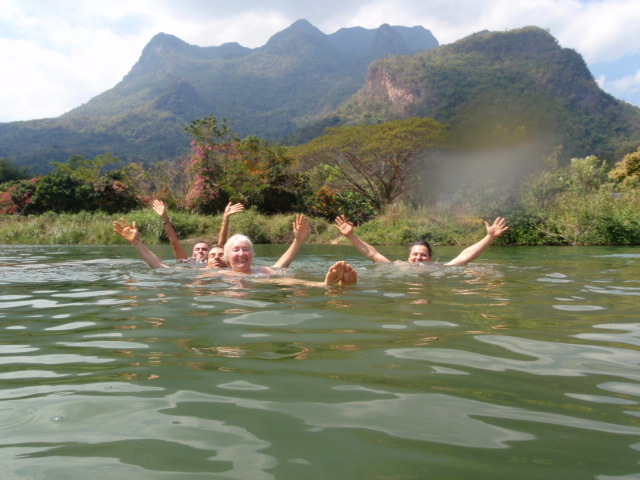 Having fun in our swimming hole! 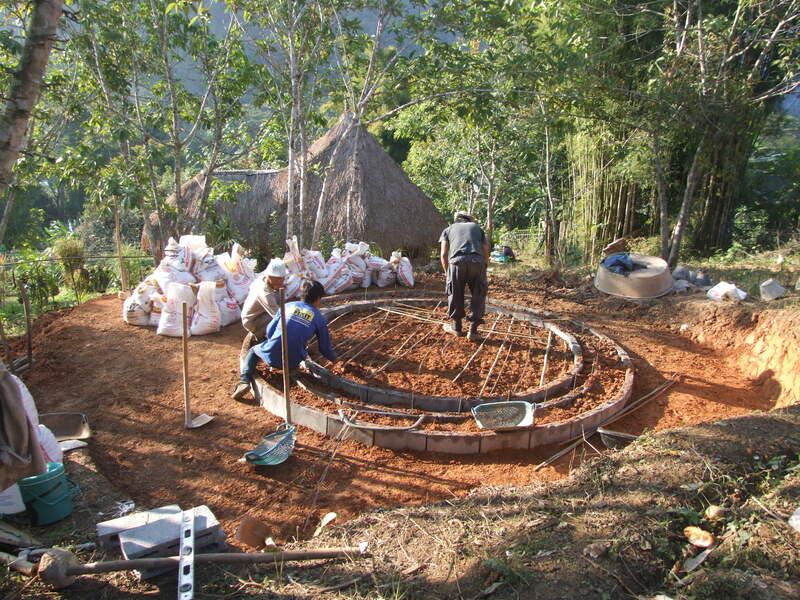 And the dome gets higher… Here you can see tamping in progress. Tamping a row of earth bags. There always has to be someone inside the dome to work the compass. Compass duty from the inside of the dome. Although the dome is not complete, it is now time to remove the wood form from the doorway. Everyone gathers with bated breath – will the earthbag arch collapse?? Removing the wooden form from the doorway. Amazing! The arch is perfect and super strong! Looking in the dome from above. You can see in the picture above the pipes for ventilation. 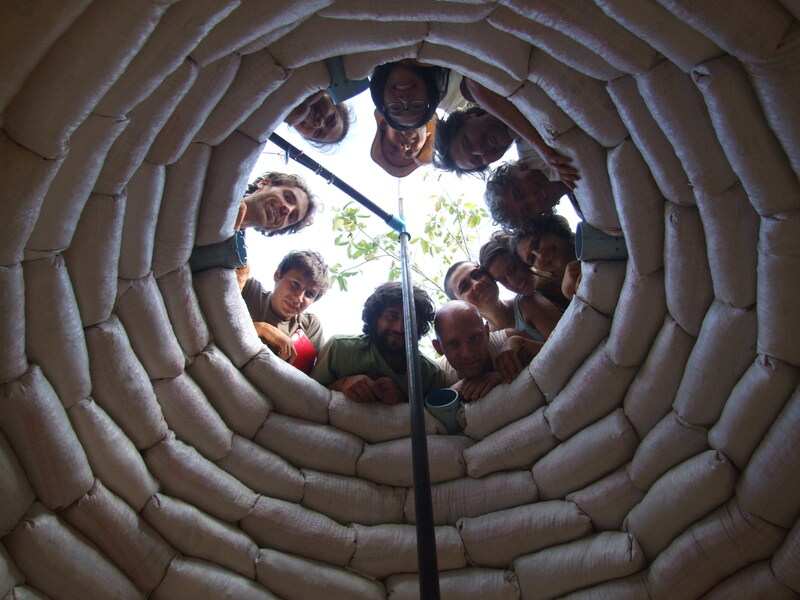 They are in the bottom of the dome and the top to allow for air circulation and prevent dampness. And the final bag goes on the top ….. The last bag goes on the top. Ajarn Paulina in front of the beautiful finished dome. Thank you all for my wonderful meditation dome! This entry was posted in Natural Building and tagged Workshops. 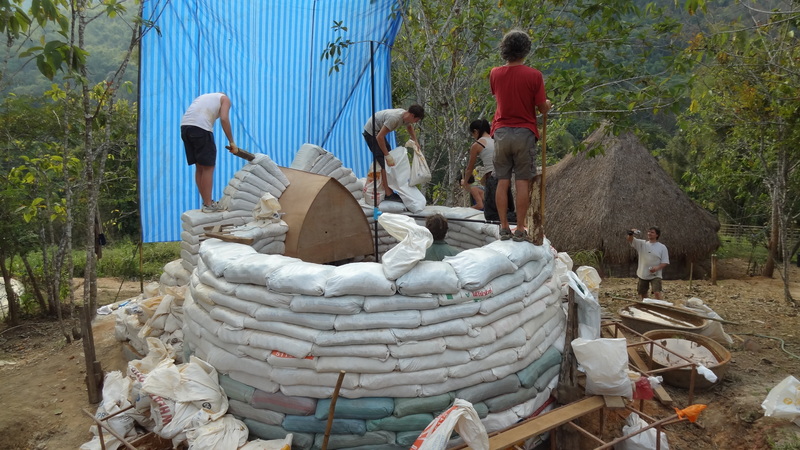 Wonderful pictorial post on an earthbag building workshop. There are so many natural technologies that solve real world problems inexpensively and sustainably;the information just needs to spread to more people so we can take collective advantage of these things to literally build a better world.